Helping clients find the right property has been the goal for my entire professional career. Real estate is an important investment and finding the right property is a great way to enjoy Tahoe. My success is measured by your satisfaction during ownership and then helping you recognize your investment return when it comes time to finally sell. I offer clients over 30 years of experience, the utmost of professional integrity, extensive knowledge of construction details, and personal insights into the different areas and nuances of enjoying this wonderful Tahoe environment. Who am I? In 1983, I began my career in Tahoe area real estate after working as a foreman of a construction crew during the summer months and ski patrolling professionally at Squaw Valley through the winters. Since 2000 I have served continuously as chairman of the Legislative and Governmental Relations committee for the TSBoR, and concurrently I have represented TSBoR as a state Director to the California Association of Realtors (CAR). My role at CAR has included numerous committee and task force appointments through the years as well as serving as the Chairperson of Region 3 in 2008 and Chair of the Land Use and Environmental Committee from 2013 to 2016 and Region 3 liaison on the Strategic Planning and Finance Committee till 2016. I have lived in Tahoe since graduating from Hobart College with a BA degree in Economics in 1976. 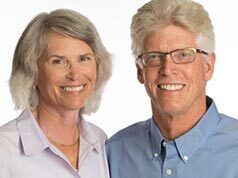 Married my wonderful wife Linda in 1985 and together we’ve raised our daughter and son, now 30 and 28 respectively, all the while enjoying the fabulous lifestyle afforded by living in this spectacular Tahoe environment. Peter and I work as a team. While he handles real estate sales, I manage escrow forms, web site maintenance, marketing, and property staging. Prior to real estate sales, I owned and operated a real estate rental business based in Alpine Meadows. Our office was an early advocate of modern technology with a web site in the late 90’s providing online booking, and integrating our software on advertising platforms such as Homeaway and VRBO. It was rewarding to see many return clients creating wonderful memories while on vacation in Tahoe. For owners, we maximized income while maintaining their real estate investment of a second home. After fifteen successful years, I sold the business and teamed up with my husband Peter. I have lived in Tahoe since graduating from Colorado State University with a BS in biochemistry. Married to Peter for over 30 years and raised our two children in this fabulous mountain environment. We really have enjoyed the Tahoe lifestyle living, working and volunteering in this beautiful place we call home.